Everyone Deserves an Escape Every Month - That means YOU! Life is stressful, and it's hard to schedule the time we all need to relax. But what if you got a care package in the mail every month, designed specifically to help you DE-stress and escape from the chaos of every day life? 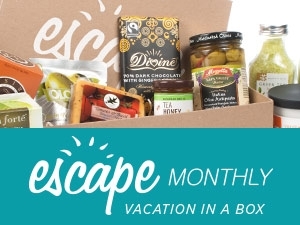 Introducing Escape Monthly: a destination-inspired monthly delivery of luxury products to help you relax and renew. Every month, they curate high-quality products to help you slip into bliss—from spa & beauty products, to gourmet snacks & gift certificates. They also give a lucky member a vacation to the destination of the month! To get started I'm excited to offer you this exclusive coupon "YOURESCAPE" to get 20% off for life of your subscription! Hurry! This is only for the first 500 members! Disclosure: This post contains affiliate links. I received no compensation or products for this promotion. My opinions are my own and may differ from those of other consumers.